The town of Kaluga, just to the south of Moscow, is a well preserved example of Catherine the Great's 18th century planning for provincial towns. “Sweet Kaluga,” as it was called in a popular Russian song from the 1960s, has become one of the more attractive and progressive mid-size cities in European Russia. Like most comparable towns, Kaluga (current population around 330,000) experienced economic and social challenges during the post-Soviet decades, but it has now achieved a stable period of growth. With a prosperity driven by forward-looking economic policies and success in attracting foreign investment, Kaluga has made noticeable progress in reviving and restoring its large historic core district. The beauty of Kaluga, which so impressed 19th-century visitors, is also enhanced by its location on tree-lined hills overlooking the Oka River. For all its attractive, placid appearance, marked by parish churches and restored bell towers, Kaluga has known times of destruction and turbulence. The first written reference to the town occurred in 1371. From the 14th century Kaluga served as fortress, and during the 15th and 16th centuries it became an important link in a defensive line to the south of Moscow. During the Time of Troubles in the early 17th century, Kaluga was wracked with fighting and attacks among various factions, including a large-scale peasant rebellion in 1606-07 led by Ivan Bolotnikov.By the mid-17th century, however, Kaluga’s favorable location for trading routes and its attractive setting had led to a return of the town to its status as a vital center to the south of Moscow. The town’s prosperity was reflected in several neighborhood churches built of brick from the 17th through the 19th centuries. Among the best examples of this parish architecture is the Church of the Intercession on the Moat, built in 1687 near the moat that had formerly surrounded the town's log fortress. The whitewashed church combines odd pediments and decorative gables (kokoshniki) with isolated classical features that illustrate the idiosyncratic uses of Western architectural elements, which had passed through many filters before reaching the builders of provincial Russian towns. Another remarkable example is the Church of St. George “at the ravine,” completed in 1701 and well preserved on the interior. During the latter part of the 18th century, Kaluga benefited from Catherine the Great’s initiative to bring clarity and functional logic to the design of provincial Russian towns. The new plan for Kaluga was formulated in 1778 by Peter Nikitin, who also oversaw much of the construction. On the site of the former kremlin and at the junction of two main roads from Moscow and Tula, Nikitin designed a trading center, or Merchants’ Court, built in two stages between 1784 and 1796 and still preserved with its fanciful arcades in a pseudo-Gothic style. Catherine also commissioned a new cathedral, dedicated to the Holy Trinity. Begun in 1786 on a design by Ivan Yasnygin, the neoclassical temple was completed only in the 1810s. 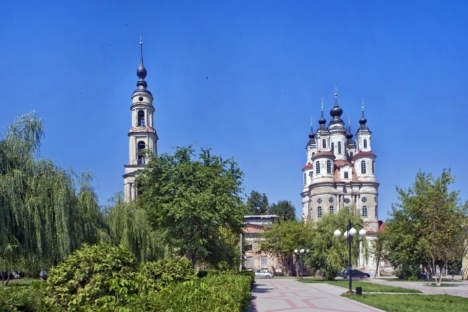 The superbly renovated cathedral is the center of the Diocese of Kaluga and Borovsk. Nearby is perhaps the most elegant administrative ensemble in Russia, designed by Nikitin to be a harmonious component within the general plan of Kaluga. At the height of its prosperity in the early 19th century, Kaluga numbered among Russia’s major cities and had a number of neoclassical townhouses whose scale and style imitated those in Moscow. The most impressive of these residences is the Zolotaryov-Kologrivov house, well preserved and now the site of the town’s local history museum. Built in 1805-1808 for the merchant P. M. Zolotaryov, son of a noted Kaluga silversmith and a descendent of traders in precious metals (the family name derives from "goldsmith"), the two-storied stuccoed brick structure is flanked by arched entryways that lead to a courtyard and park extending to the banks of the Oka River. The center of this neoclassical masterpiece is divided into three vertical segments, each of which culminates in a high-relief plaster panel on themes from the Iliad: the quarrel of the Goddesses, the judgement of Paris, and the Sacrifice. The flanking gateways, with exquisite wrought-iron tracery, are decorated with figures trumpeting glory. Even the service buildings enclosing the courtyard display plaster medallions drawn from classical mythology. Zolotaryov's profession brought him into wealthy circles in both Moscow and Petersburg, where he gained a familiarity with the latest in neoclassical architecture and design. This is most evident in the interior of the house, decorated by the Moscow firm of S. P. Campioni. From the vestibule to the state rooms on the main floor, the walls and ceilings are a showpiece of the decorative arts. The largest space is the ballroom, with a wall painting in the style of Hubert Robert. Campioni's group included Italian master artisans, who produced the best examples of such work in both Moscow and Petersburg. The Zolotaryov house demonstrates the degree to which wealthy merchants from the provinces had accepted the culture of neoclassicism in its most refined expression. The elegance of Kaluga’s townhouses was complemented by neoclassical churches and bell towers, as well as institutional buildings such as the Noblemen's Assembly. Even the War of 1812, so destructive for large areas of central Russia, proved a boon to Kaluga, whose strategic location made it a staging and supply point for the Russian counter-offensive against Napoleon's retreating armies--and further contributed to its prosperity. By the mid-19th century, however, the town’s commercial significance declined along with the decline of the Oka River as a transportation artery. Even the coming of the railway, in 1874, did little to reverse Kaluga’s lack of competitive strength. The 20th century brought new trials, including occupation by German forces in the fall of 1941. Kaluga was liberated at the end of December 1941 and played an important role in the Soviet war effort. Kaluga is also known as the home of the visionary space pioneer, Konstantin Tsiolkovsky (1857-1935), who is honored by a large museum dedicated to his work in rocket science. Among its other technical and educational distinctions, the Kaluga region has become a leader in Russia’s automotive industry, with foreign firms including Volkswagen, Volvo, Mitsubishi, Peugeot and Citroën. The city is readily accessible from Moscow (110 miles), both by rail and by a major highway. Kaluga’s recent success in combining economic progress - including new hotels - with concern for cultural heritage makes it an attractive destination, whether for a day trip or a longer visit.